YOU MUST READ THE PART ONE RECAP FIRST so you know where I am going with things. For starters, HERE IS THE REVISED AND COMPLETED MAP ON GOOGLE MAPS – Mad River Cemeteries. I had a little fun with the markers, don’t hold it against me. 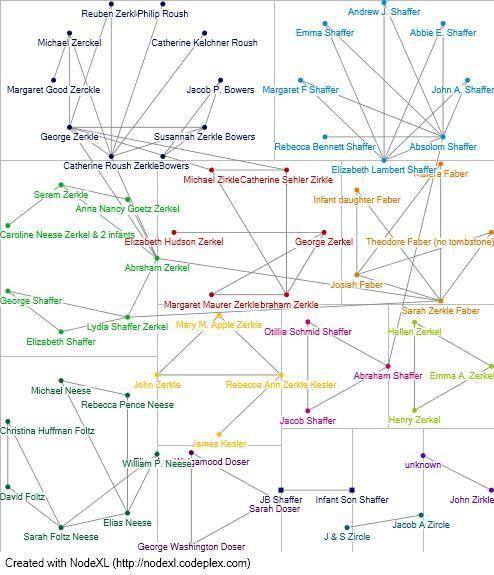 I did color code Shaffer, Zerkle, and Terre Haute to correspond with my NodeXL relationship charts. And that brings me to the NodeXL charts I created. 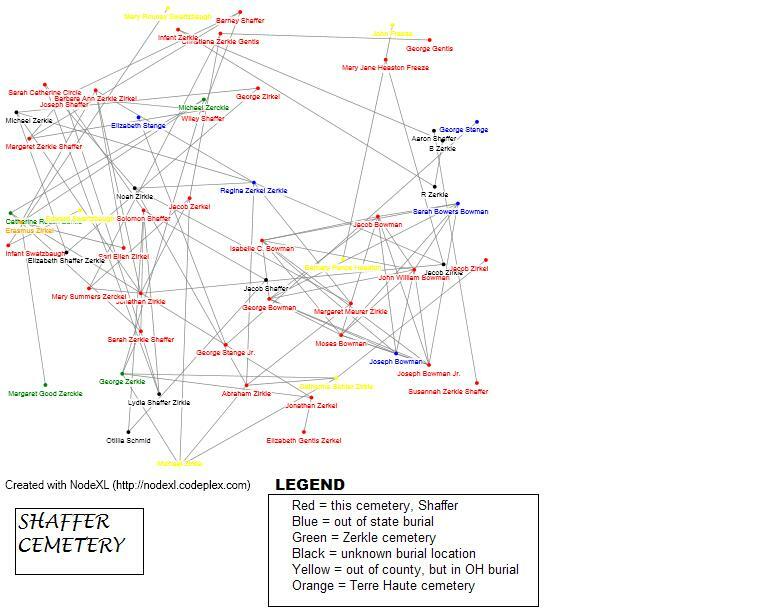 The above two NodeXL charts show the relationships between the people in each cemetery (connections) and where they are buried (color). Corresponding colors in each indicate which families are related. As I said before in my first test, these won’t work for a larger data set so that is why I didn’t include one for Terre Haute. It is the largest cemetery and there is no way I could represent it in a NodeXL file. You can see some of the relations are indicated above in Orange. The two NodeXL charts above show the relationships between the people buried in the cemetery and between those buried across the cemeteries. The colors indicate relationships. 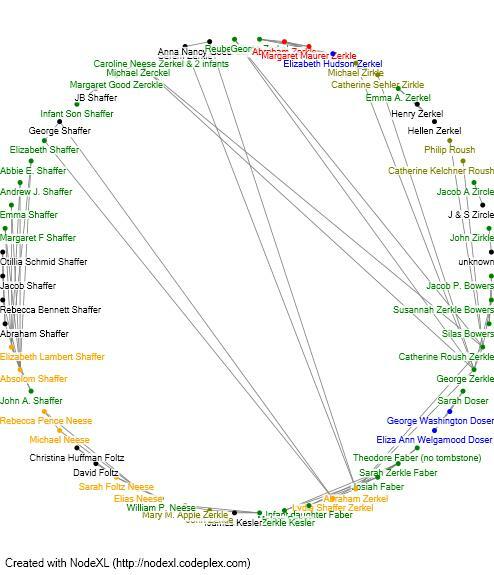 You can see the two largest families are the George and Catherine (Roush) Zirkle families (indicated by aqua) and the Abraham and Margaret (Maurer) Zirkle families (indicated in blue – not exactly the same color blue, oops. It’s a royal blue in the Shaffer cemetery and a dark blue in the Zerkle cemetery). Incidentally, George and Abraham were brothers. The above cluster was just something I used in the analyzation section of NodeXL. I love how it came out but I don’t know how I did it. 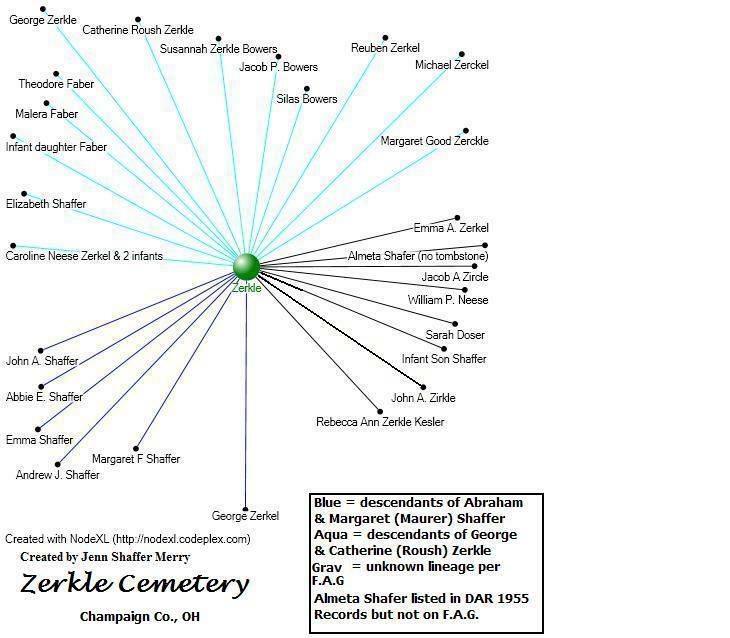 It shows the different family relations in the Zerkle cemetery. The program chose the colors, so they really don’t indicate anything other than a family relationship. I tried to repeat it in the Shaffer cemetery but couldn’t. You can see how this would never work for a larger data set, it’s almost too much here. So there we go. I’ve visualized until my eyes were ready to pop out. I welcome feedback. If anyone can tell me how to do a relationship chart for a really BIG set of data, please let me know! 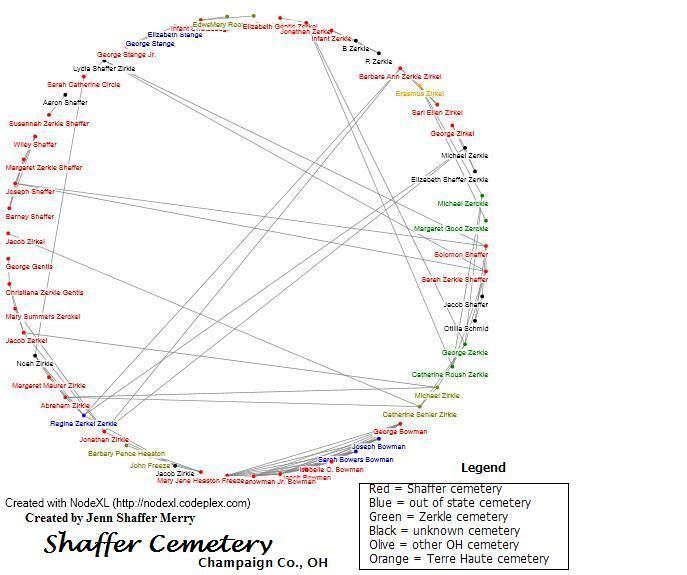 So this time I thought I would try to show the relationships between the people buried in two cemeteries, Shaffer and Zerkle, in Mad River township, Champaign county, OH. If that worked, I could continue to add cemeteries until I had the whole township’s relationships plotted. 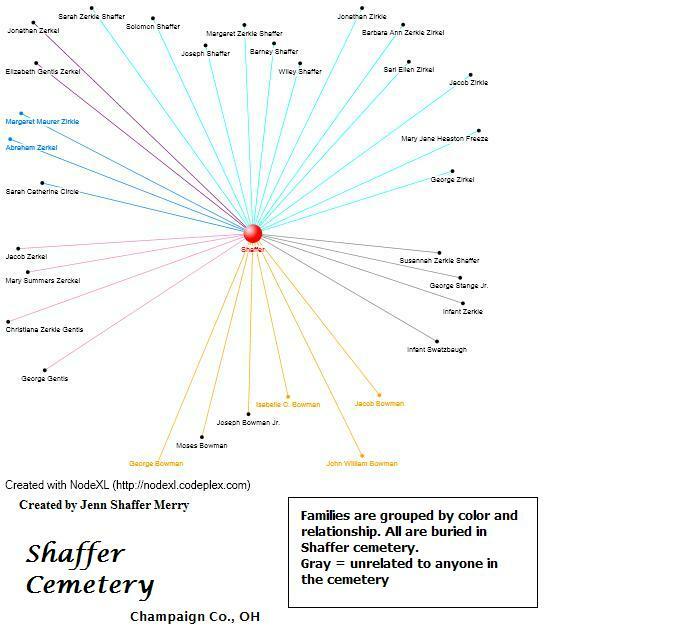 I started with the Shaffer cemetery database I created. 1) I first realized that in order to relate this to the much larger project (that being a cemetery database and website that I am currently formulating and just have ideas about so can’t share much yet), I needed to use the information (names and relationships) solely from Findagrave.com and not any of the other resources I had used to compile my list. It had to be the crowd-sourced information. So that is what I used. (2) I realized I could not be true to the actual name as it is spelled on each headstone, otherwise the information wouldn’t graph properly. So I had to standardize a little. (For example, Abraham Zerkel is spelled that way on his headstone, but his wife Margaret’s stone says she is wife of Abraham Zirkle. If I showed their relationship that way, the program would think I had two different Abrahams.) I also had to change some surname spellings due to duplicates. Jacob, Jonathan, and Michael all had same surname spellings for multiple different people. I did the best I could but I had to make sure the relationships graphed properly. (3) I saved it as a TIFF file and used Paint to add the legend and a title. I learned that you cannot upload a TIFF file to WordPress. Frustrating! I had to convert it to JPEG so I didn’t have to re-do the legend that I made. So although I am scrapping this idea, I did learn a couple of things that are relevant to my genealogy research, though perhaps not this project. On to test number three…which I hope is the last! Please comment if you have any suggestions or anything you’d like to add.